I once participated in a discussion at Connecticut’s Mystic Seaport museum with an august group of yachting historians, designers and builders. 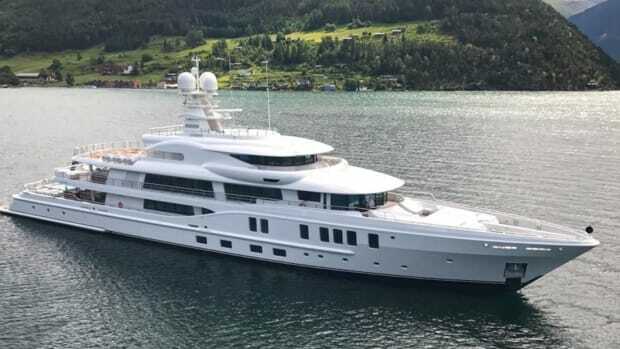 The subject was the fundamental question, “What is a yacht?” You’d think such a group with so simple a question might quickly reach some consensus, but an hour in, the verdict was still out. Over the years, I’ve had similar debates focused on whether yachting is a sport or a lifestyle. 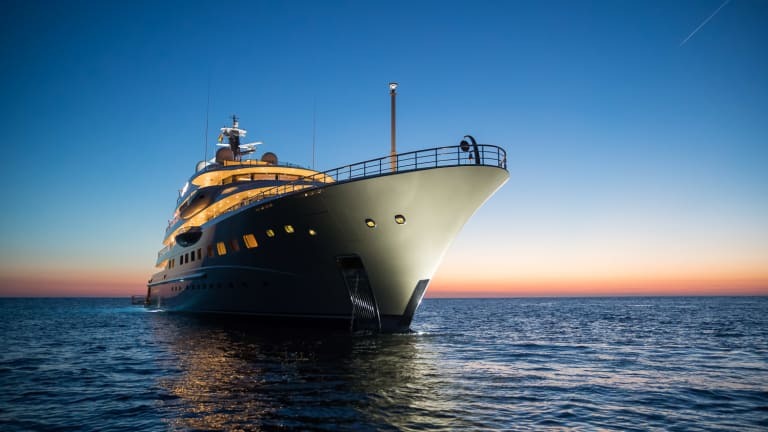 In some ways, that’s a more absorbing question, and my conclusion has always fallen on the latter definition, especially when the subject is large motoryachts—which generally are all about the lifestyle preferences of their owners, from décor to amenities to intended use. 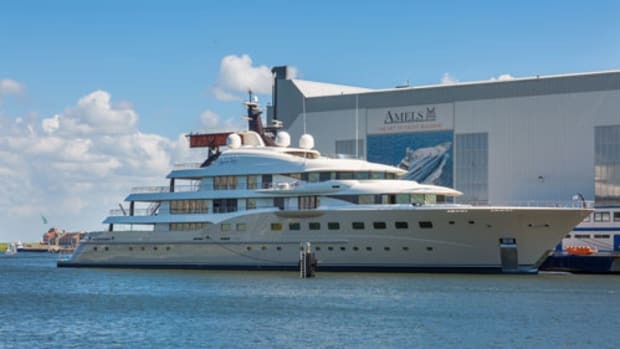 What makes the first Amels Limited Editions 272, Here Comes the Sun, so worthy of discussion is that she was designed around the lifestyle preferences of not one, but two owners who hail from different continents and cultures. What easily could have been an unfortunate hodgepodge proved a cohesive integration of taste, style, luxury and amenities built around her owners’ shared vision for spending time with their expanding families. 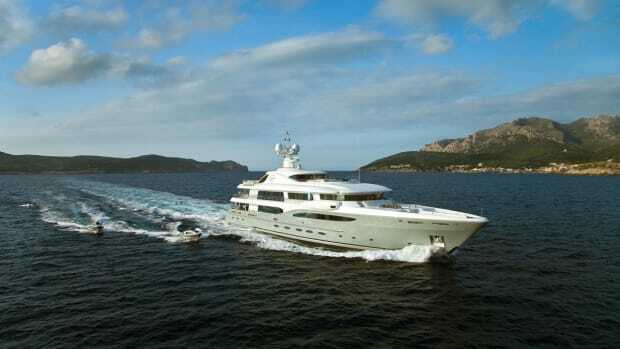 ...When I stepped aboard Here Comes the Sun off Mallorca, in Spain’s Balearic Isles, I found a well-proportioned, beautifully crafted expression of luxury yachting. Lifestyle functions on multiple levels and involves amenities, ergonomics, décor and a host of other, more ethereal elements. 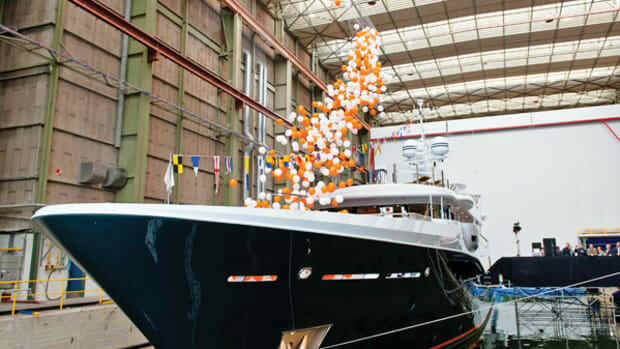 Andrew Winch, founder and creative director of Winch Design, which created the interior, says the process was a relative breeze, in part because he and his team leader, Jim Dixon, already had a strong sense of the owners’ tastes from designing their previous yacht, a smaller Amels Limited Editions called Imagine. The understated elegance of Here Comes the Sun’s interior obviously is intended to soothe the senses and facilitate relaxation. Natural and bleached oak, brushed perrera stone from Spain and leather accents gently massage the eyes and brain. 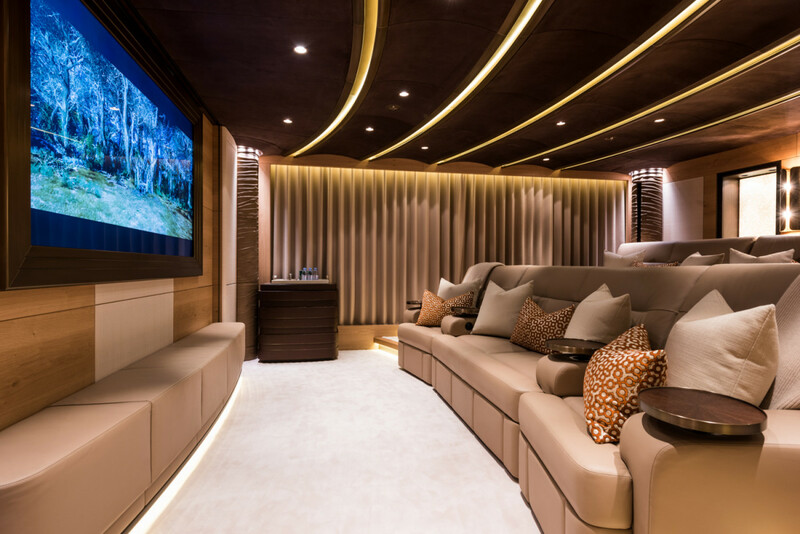 A subtle vineyard motif appears in different parts of the yacht and infuses the ambience with a whiff of the organic, as do the carved oak wall panels that line some of the companionways. The sole-to-ceiling paneling conceals crew access doors. 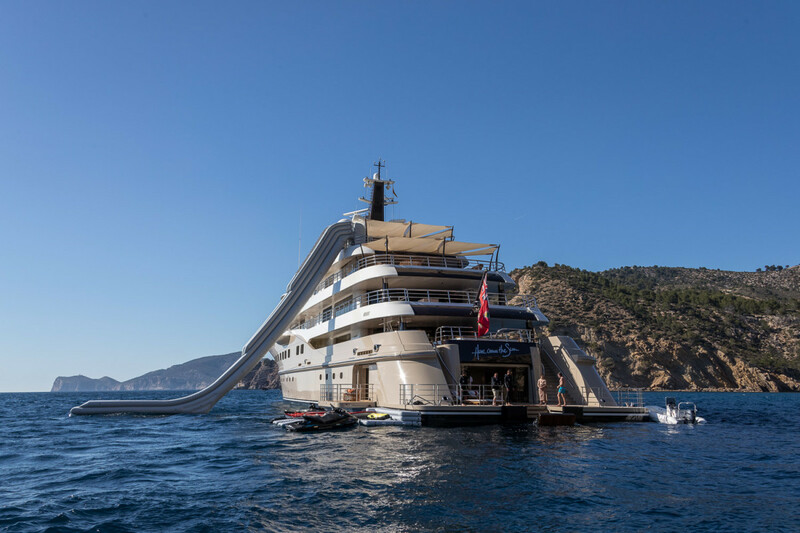 A decorative spiral theme evocative of an Archimedean screw appears throughout the yacht. Winch custom-designed furniture to occupy nearly every space, in keeping with the owners’ tastes and lifestyles. Light and lightness are in. Ostentatious bling is out. 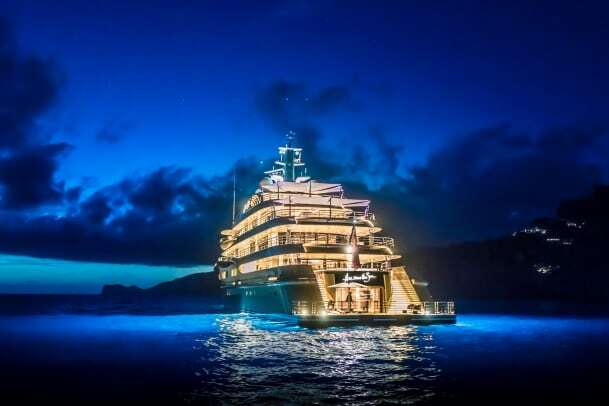 The vineyard theme (one of the principals owns one) is most prominent on the outer walls of the central staircase, which wraps around a glass-walled elevator that runs from the bottom of the yacht to the top. The stairs are cantilevered off the wall and don’t touch the elevator shaft, creating an architectural element. 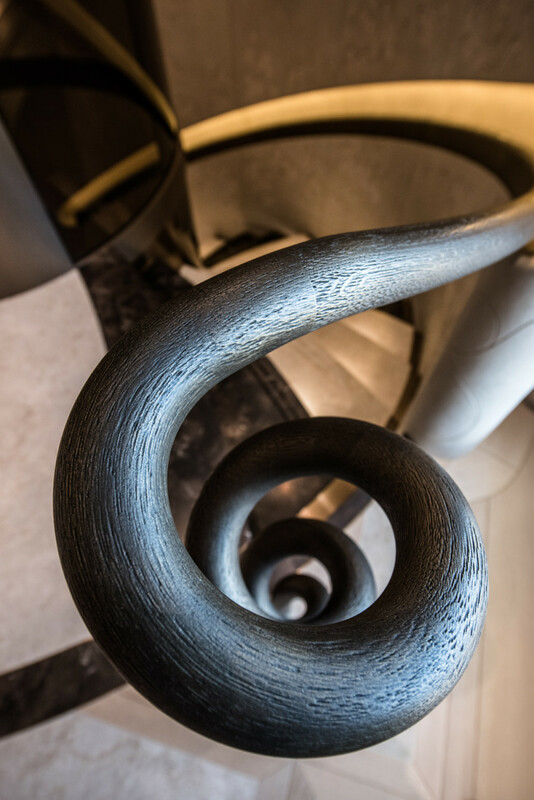 The handrail is a patinated oak rendition of a gnarled grape vine that also plays on the spiral theme. Images of grapes and leaves in Jesmonite panels created from hard-carved molds run down the walls and are in full view from inside the elevator. 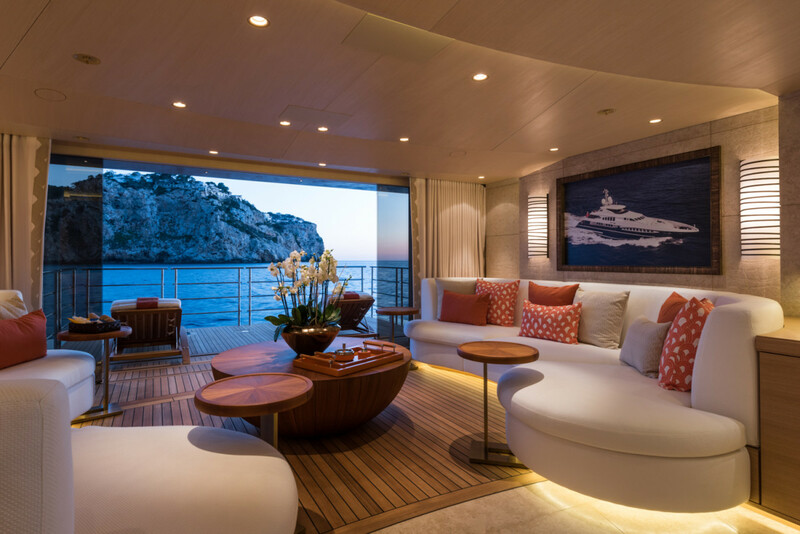 The panels also appear in random places throughout the yacht. Interior tones are dominated by honey, chocolate and cream. Here Comes the Sun is about relaxation—a family chill machine on a grand scale. Evidence was at my feet as I stepped off the tender onto the swim platform. The beach club and spa are a testament to sybaritic indulgence. With three sides able to open to the elements, the space is a health club in miniature with a gym; separate sauna and steam rooms; and a lounge with sofas, a juice and cocktail bar, and outboard teak-decked sunning space. 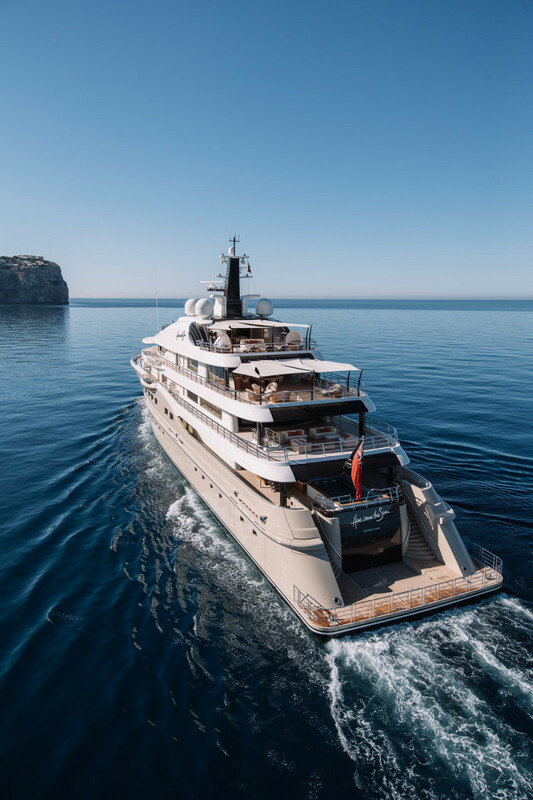 Small moments of water-based escape are dispersed throughout the yacht’s upper decks, too: a pearlescent blue mosaic-tiled pool with barstools inside and step-in access on the main deck, and a spa pool on the sundeck. The yacht carries a limo tender, a RIB and personal watercraft. Noteworthy gathering spots for smaller groups include leather lounges for six in the wheelhouse and a cinema on the main deck. The projection system has a screen that retracts to reveal a TV for video games. 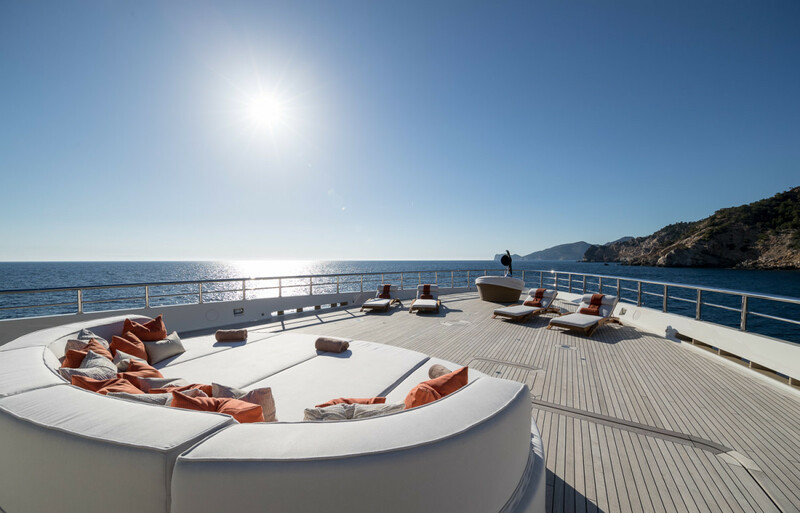 For guests who prefer to gather with just their thoughts, exterior designer Tim Heywood repeated a feature he used on the owners’ previous yacht: On either side of the sundeck, small lounges are shielded by what Heywood calls a “lobster back” screen, a detail that furthers the theme of tranquility. 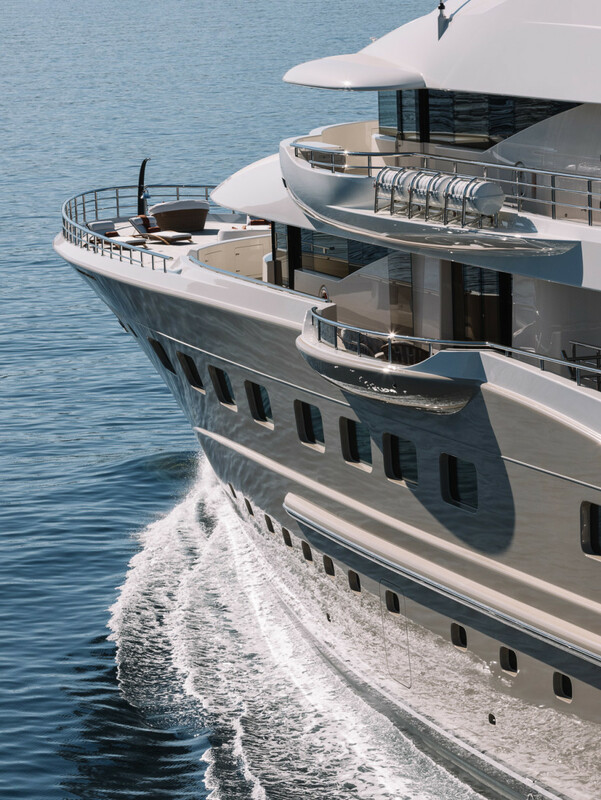 Heywood and Winch have collaborated on nine Amels Limited Editions builds since 2007, with Winch on the interiors and Heywood styling the exteriors. 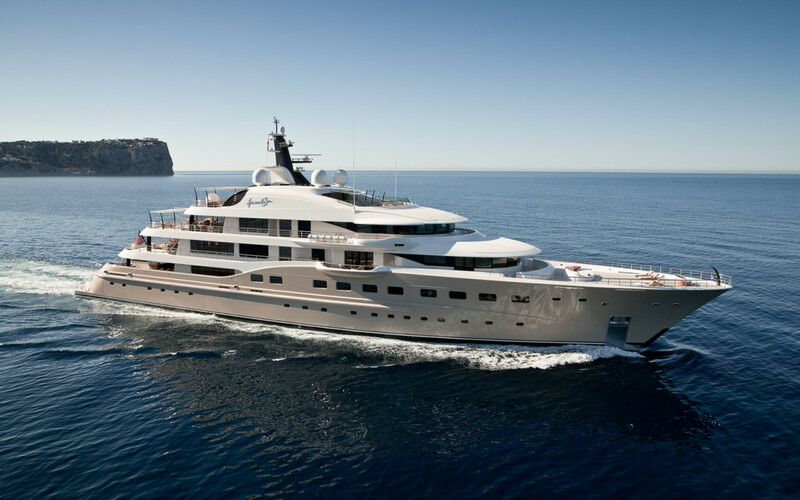 On Here Comes the Sun, Heywood’s mark is evident in the yacht’s sensual profile, which shows a bump in the line of the bulwark as it rises toward the bow. 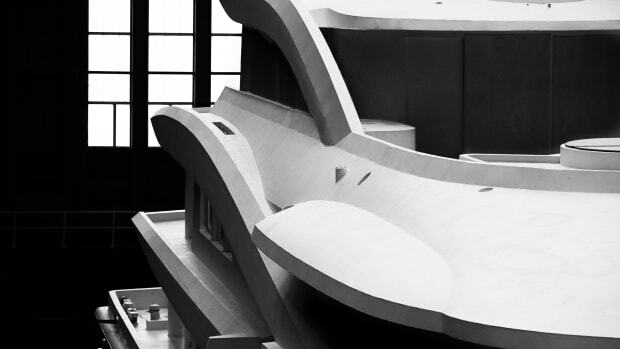 It is no minor task to make a yacht with an interior volume of more than 2,800 gross tons appear svelte. Another Heywood flourish is the covered wing stations. 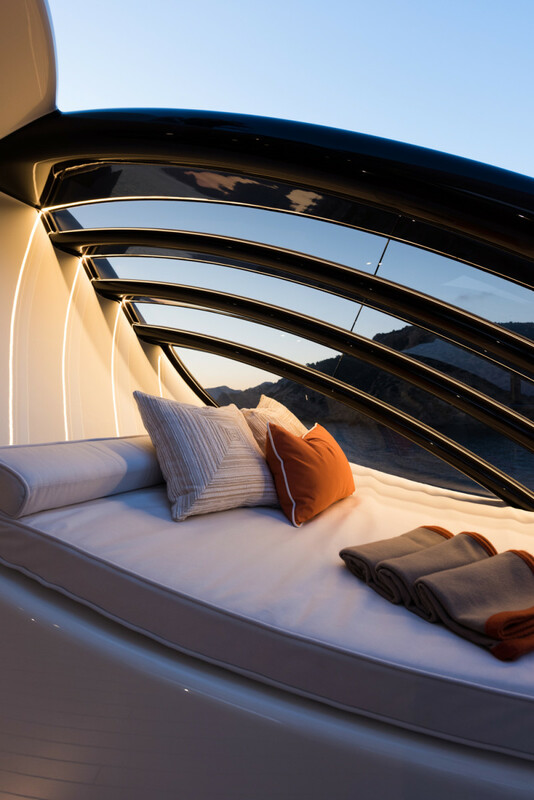 On Here Comes the Sun, the decks of the wing stations provide cover to a pair of balconies below on the owners’ deck—a space that extends from stem to stern, offering both intimacy and flexibility. 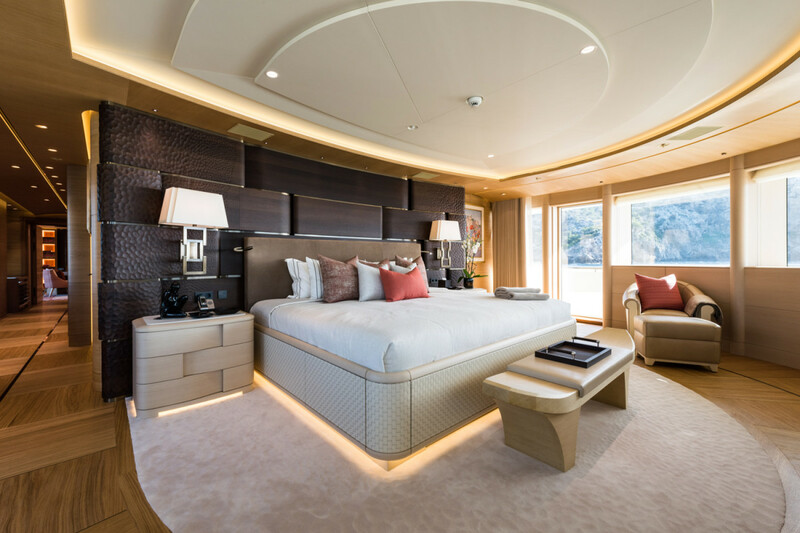 Conceived as a “duplex,” the master stateroom is arranged to accommodate a couple, his-and-her separate suites or a master and guest staterooms. The “her” suite is decorated in heavily lacquered creams and whites with mother of pearl inlays suggestive of a light Hollywood Art Deco style. The dressing area includes jewelry and shoe stowage, and the vanity faces a port that looks over the sea and scenery. A fixed balcony allows respite and fresh air. The larger “his” or “theirs” space is markedly more masculine, with chiseled oak walls and textured carpet, and display cases for the owners’ collectibles and artifacts. The masterstroke is the study, which has its own balcony, horsehide overheads and delicate, stitched eel skin wall coverings behind the bookcases. 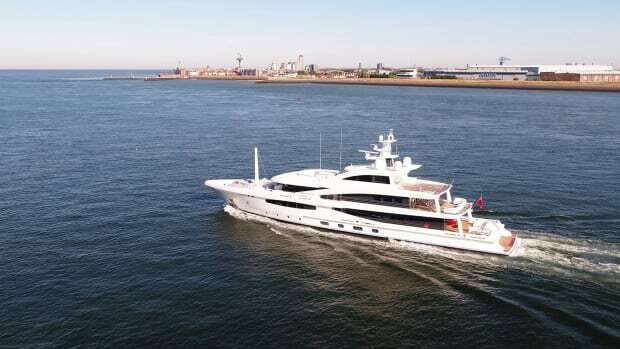 “This is a room that will help him make a good decision or a difficult decision,” Winch says of an owner doing business aboard—or writing a compelling novel, or just having an inspired think in private, in view of the sea and surroundings. 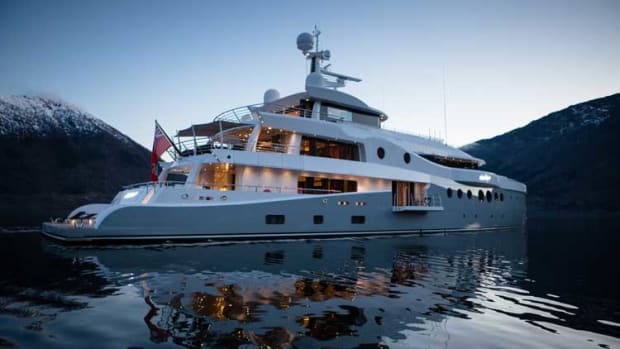 Other owners’ deck highlights include a salon aft and step-out access to the broad teak expanse of the foredeck, which doubles as a touch-and-go helipad. Here Comes the Sun is available on a limited basis for charter through Fraser and carries 12 guests (18 for private operation). 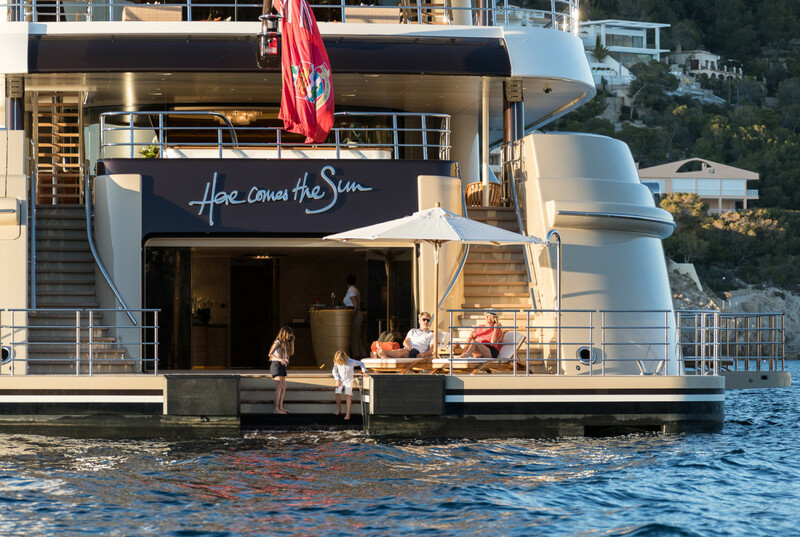 In an increasingly rare occurrence, our small group of visitors to the yacht in Mallorca was treated to a brief, but revealing cruise on Here Comes the Sun. While the group was served a four-star lunch in the main dining area of the bridge deck, few noticed the yacht had weighed anchor and was moving along the towering headlands that command the southern end of the island. The sea state was calm, but there was no noticeable roll, the slightest evidence of noise nor vibration from her main engines. As if on cue, no sooner had we left the anchorage than the clouds parted and the sun appeared. 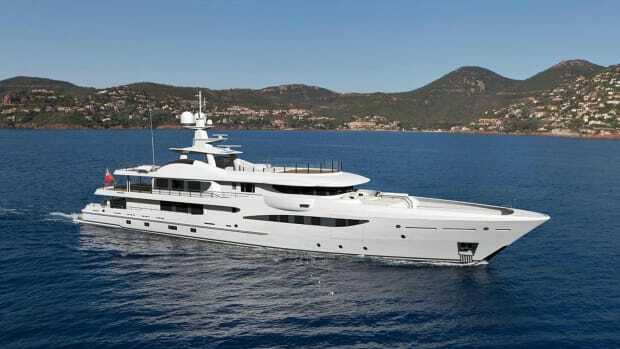 You couldn’t help referencing the classic single from the Beatles’ “Abbey Road,” from which the yacht takes her name.